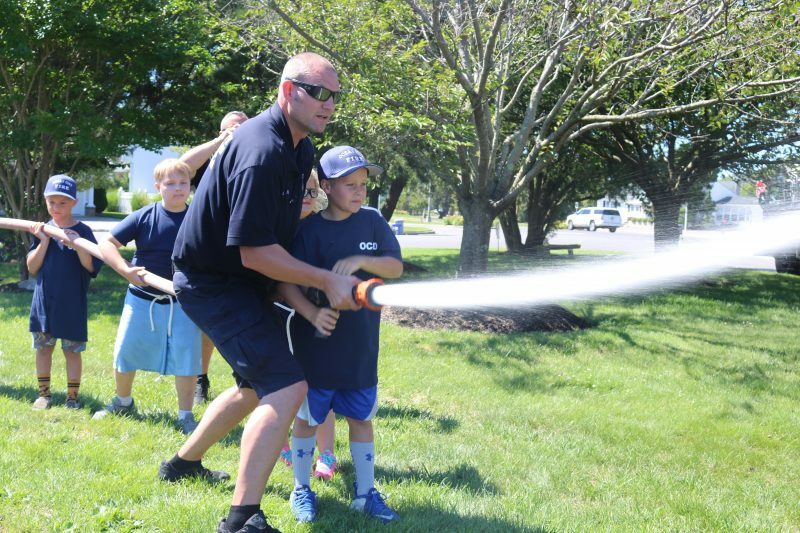 The Ocean City Fire Department's Junior Firefighter Program began Monday. 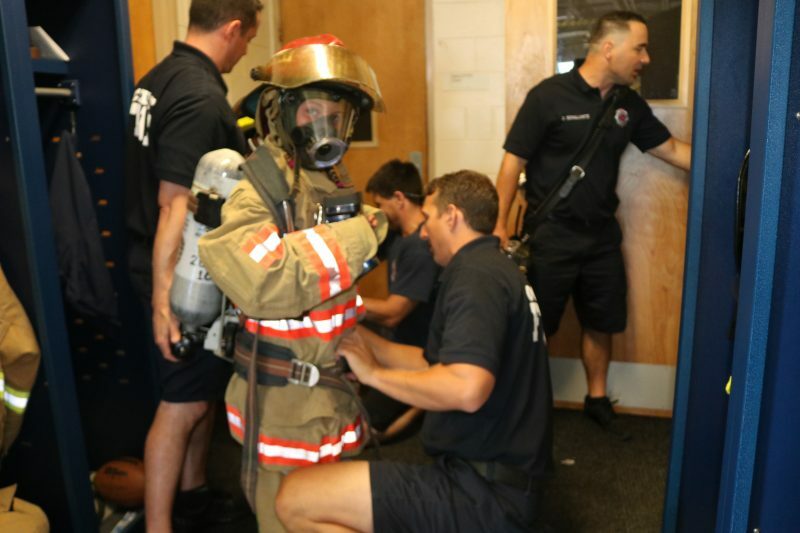 Kids spend four days learning what it is like to be a firefighter. Faelyn Clark heaved on her firefighter gear and her oxygen. She made sure to check her thermal imaging camera that hung from her right pocket. She was ready to go in with her fellow firefighters. She entered a smoky room searching for potential victims of a fire. “Is anyone in there?” one firefighter called out. No one answered. After a search they determined it was all clear. It wasn’t a real fire and Faelyn, of Ocean City, is just 9-years-old. Monday was the first of a four-day Junior Firefighters Camp, in which kids ages 9 to 13 learn hands-on what it is like to be a firefighter. 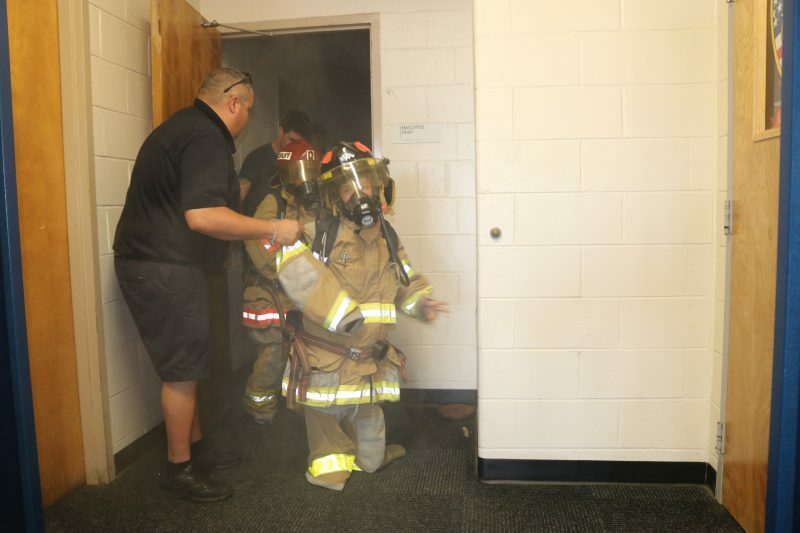 The “firefighters” were fellow camp kids who wore self-contained breathing apparatus (SCBA) to enter a “smoke house,” which was the Ocean City Fire Department dorm filled with theatre smoke used to simulate a real fire. 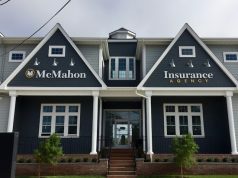 This is the ninth year of the program, which is held at the Fire Department headquarters on the 500 block of Asbury Avenue. 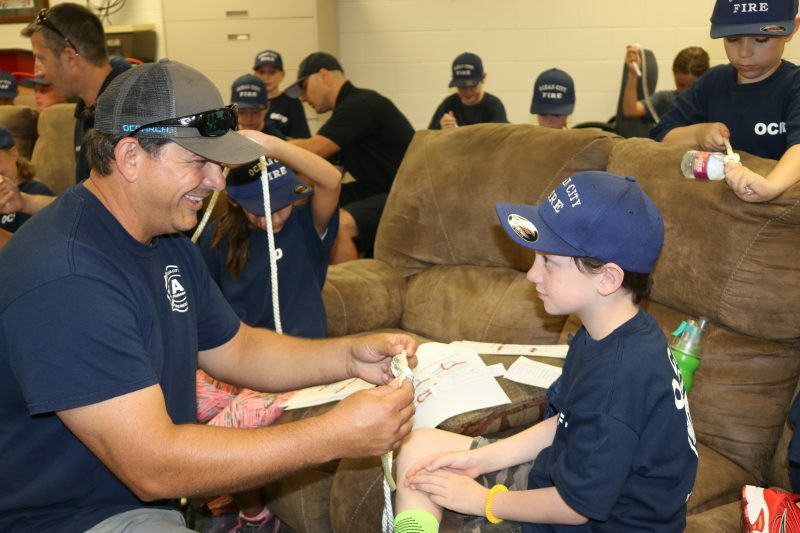 It is staffed by firefighters who volunteer on their days off to teach the camp. Captain Bill Martin helps a young “firefighter” steady the hose. Fire Chief Jim Smith said the camp is the number one camp out of all the city’s recreation programs. 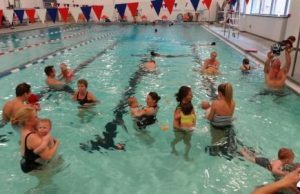 The camp is from 9 a.m. to 12 p.m. through Thursday and culminates with a pizza party and a ceremony where all the participants receive certificates. 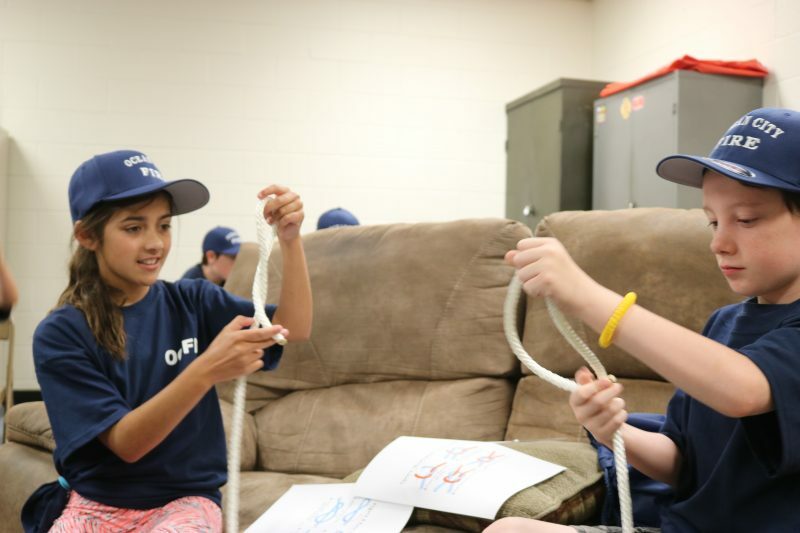 In addition to the “smoke room,” kids learn to tie knots, a basic but important tool for firefighters, fire officials said. The kids also learn some CPR, bandaging and other necessary training. One of the real exciting parts of the camp includes riding on the fire trucks. Some “campers” got to take rides Monday. 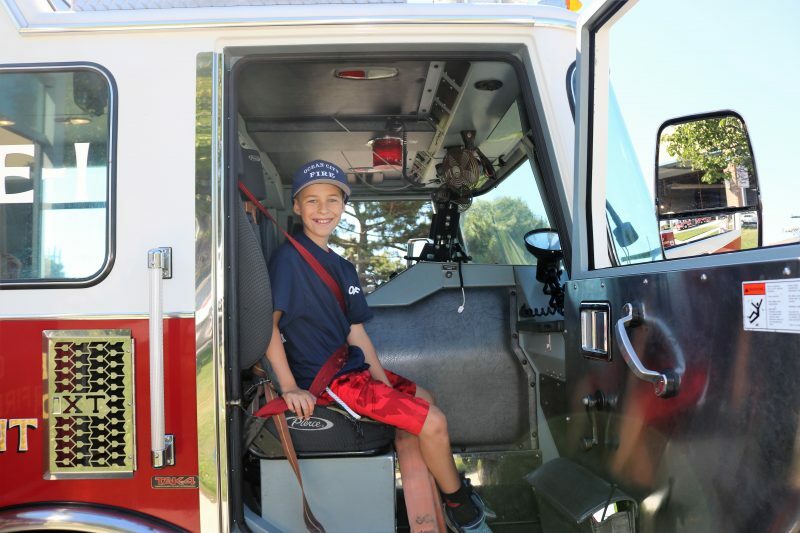 Ezra Jones, 12, is happy to be in the “captain’s seat,” a term for the passenger front seat of a fire truck. 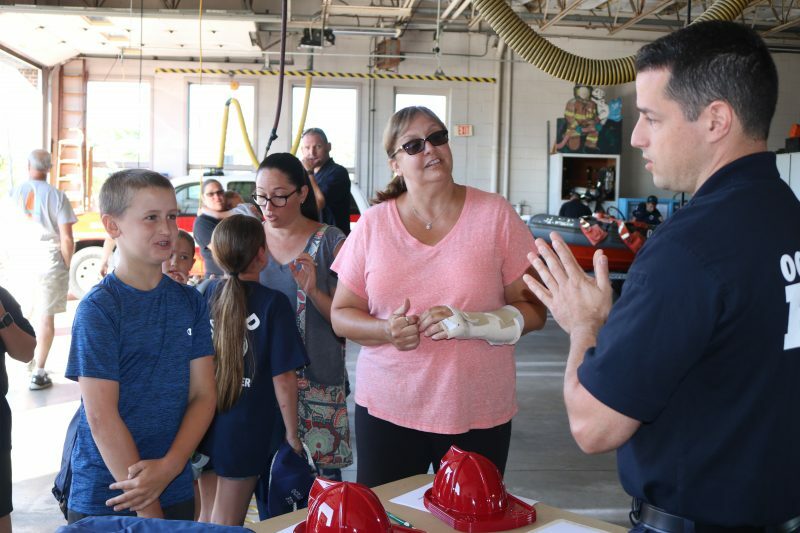 Later in the week the kids will also get to climb an aerial truck ladder, utilize the Jaws of Life and even repel if they would like, Smith explained. 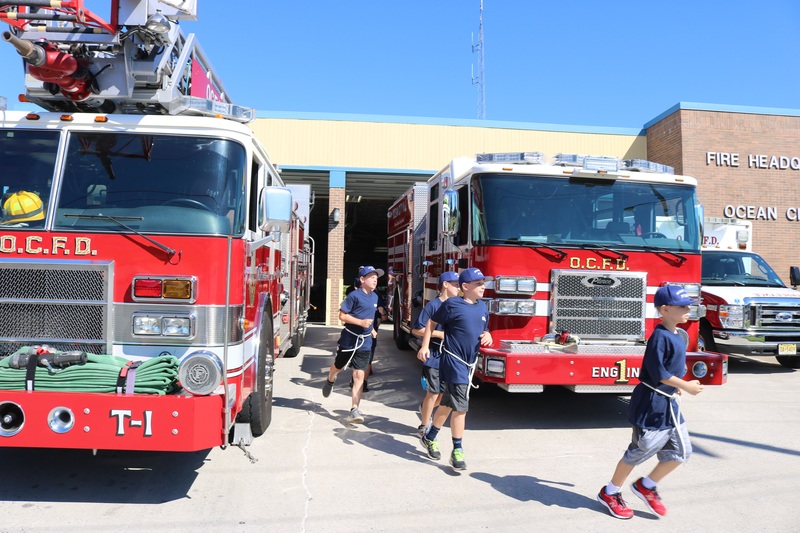 Monday morning started off with knot tying, then a warm up jog around the fire department and some stretches before “campers” were off to their “fire companies,” broken off by age. During rides in the fire truck, some participants got to sit in the “captain’s seat,” which is the front passenger seat and they got to honk the horn, when they got the go-ahead. Ezra Jones, 12, of Toronto, and his family, vacation in Ocean City. 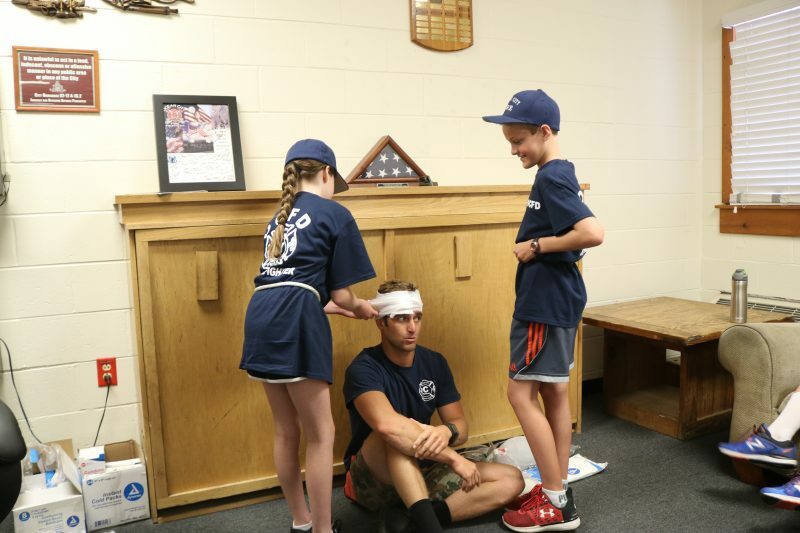 Every year he participates in the Junior Firefighter Camp. “It’s the reason I got out of bed this morning,” Ezra said with a laugh. Then Ezra and Shallcross, along with their “fire company” hopped on a fire truck and away they went. Faelyn’s dad, Captain Ray Clark said the camp is all about the kids. Some “firefighters” open the hydrant. 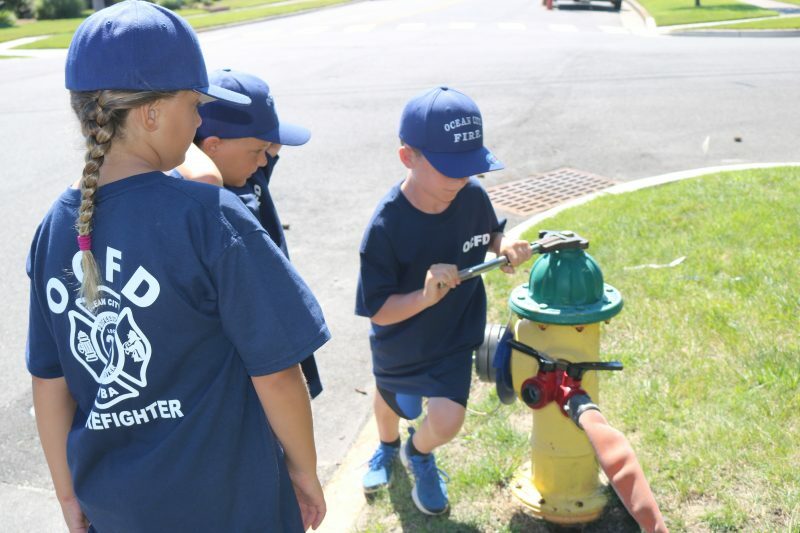 When some of the kids went out in the fire truck to the Gardens section of Ocean City they not only used a wrench to open a fire hydrant but worked the hose. They got some help from Captain Bill Martin. Martin gave the kids pointers and made sure he had a strong grip on the hose when the kids tried it out. He said that is because when water comes out, it can release as much as 50 pounds of pressure. While many of the firefighters assist in making the program possible, Deputy Chief Vito DiMarco oversees the program. Lea Walker, of Upper Township, and Zac McIntyre, of Galloway Township, tie figure eights. “The camp really gives an overview of what it is like as a firefighter. 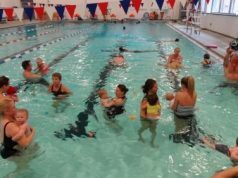 The kids get to learn different things each day,” he said. The camp, which costs about $110 per child, fills up quickly and the cut off is around 30 students. Like Ezra, many kids come back year after year because they enjoy the program so much, DiMarco said. “They become friends with each other and the guys in the department,” he said. Deputy Chief Vito DiMarco talks to Bridget Brogan and her son Jack, of Upper Township, about the program. At the beginning of the day, Jack Brogan, 11, of Upper Township was happy to get his shirt, hat and rope from DiMarco for the first day of class. He didn’t get in last year. Jack said he wants to be a police officer when he grows up. 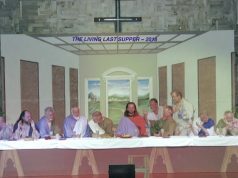 “He loves helping people,” Brogan said. Brothers Nate and Tyler Waters, of Linwood, like Junior Firefighter Camp. “I like going into the smoke room,” said Nate. Also, along for the camp was Jay Heal, also of Linwood. He is a newcomer to the camp and said he couldn’t wait to try it. Their friend Andrew Stauffer, of Ocean City, doesn’t mind heights. “I like repelling,” he said. 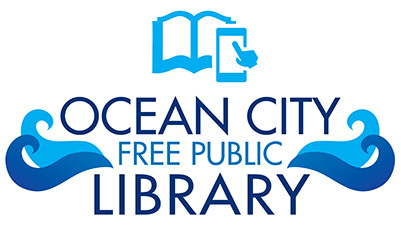 For more information about the program visit www.ocnj.us/recreation/. 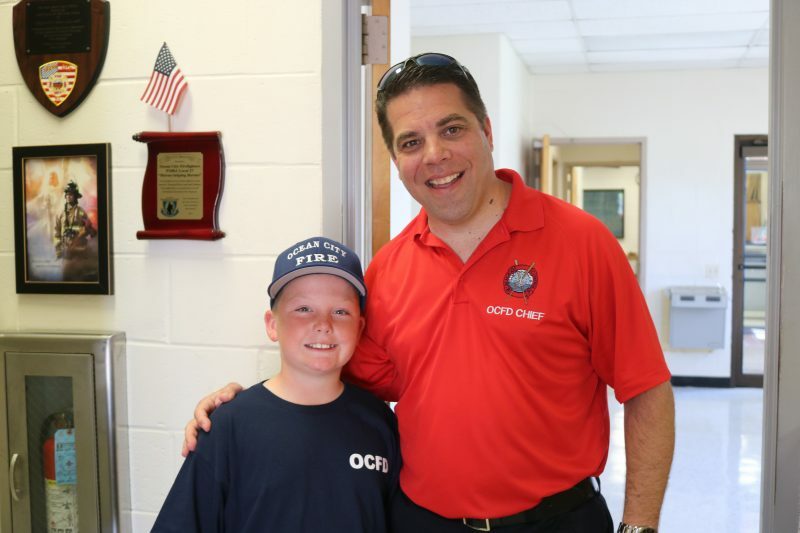 Fire Chief Jim Smith with Brendan Geary, 11, of Ocean City, who says he loves the camp and does it every year. Captain Bernie Walker gives Zac McIntyre some instruction. Faelyn Clark with her dad Captain Ray Clark.